Since January 2014, Internet Explorer 11 availability with Windows 8.1, Firefox 26 and Google Chrome 32 has released. Have you known? IE8 is most used as web browser in IE Market Shares. As a web designer/developer, it’s always our goal to give our website visitors better experience on viewing our site. That’s why I recommend you take care of your website layouts (WordPress themes, Joomla Templates …) with old browsers, especialy for earlier versions of IE. 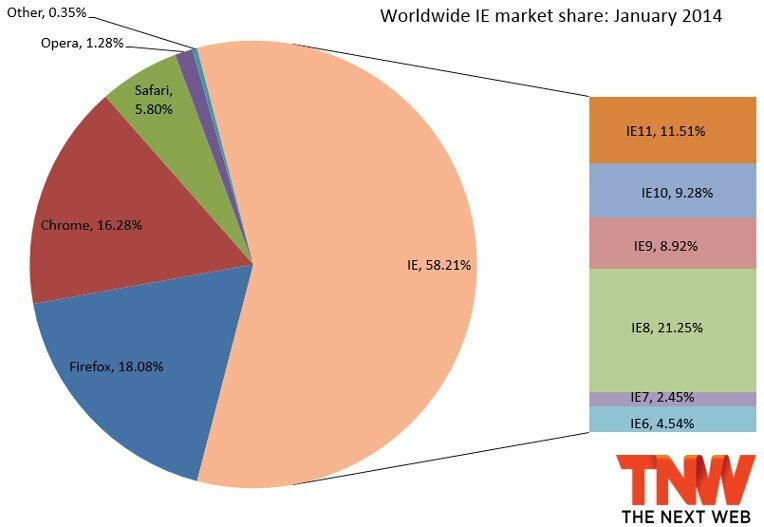 IE Market Shares – January 2014. Image Copyright by The Next Web. The following will allow your sites to quickly and almost magically work better in Microsoft’s flagship browser! Many people don’t know this, but WordPress provides several global variables that we can use to do browser detection.. The variables WordPress provides are as follows: $is_lynx, $is_gecko, $is_IE, $is_winIE, $is_macIE, $is_opera, $is_NS4, $is_safari, $is_chrome, $is_iphone. We can use this result to tell the user’s browsers how to rendering your website layouts which has built with HTML5 and CSS3. There are 3 really helpful scripts that add better compatibility for “modern” things such as responsive design, CSS pseudo-classes and attribute selectors as well as HTML5 tags. HTML5 Shiv is maintained by Alexander Farkas, Jonathan Neal and Paul Irish, with many contributions from John-David Dalton. It is also distributed with Modernizr, and the two google code projects, html5shiv and html5shim, maintained by Remy Sharp. An absolute must for your modern projects. Only loaded for old IE’s. A fast & lightweight polyfill for min/max-width CSS3 Media Queries (for IE 6-8, and more). The goal of this script is to provide a fast and lightweight (3kb minified / 1kb gzipped) script to enable responsive web designs in browsers that don’t support CSS3 Media Queries – in particular, Internet Explorer 8 and under. It’s written in such a way that it will probably patch support for other non-supporting browsers as well (more information on that soon). Using vendor prefixes will save you a lot of time without worrying if the browser supports your CSS. Check out the following list of vendor prefixes. And there we go. Somewhat better browser support and less headache if you want to attempt to support old version of Internet Explorer. IE8 will treat it as a block level element unless you use float.